Right yaaa Wrong | KMI Music Bank, your bollywood specilist! 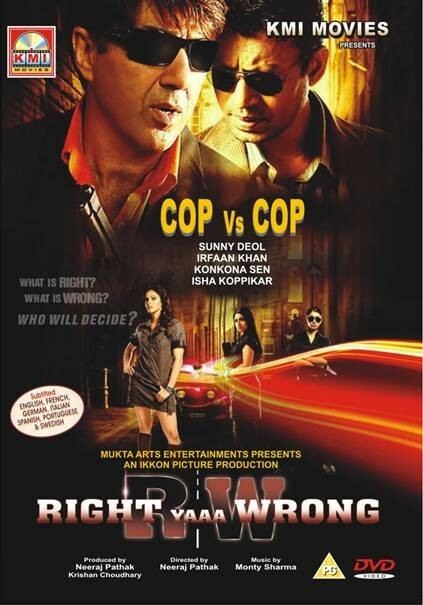 Right Yaa Wrong is the story of two cops, Ajay Shridhar (Sunny Deol) and Vinay Patnaik (Irrfan Khan), where an intense rivalry leads them on a battle for supremacy. Ajay's wife (Isha Koppikar) is found brutally murdered. Ajay is the prime suspect and his nemesis ACP Rane is heading the case. Vidya (Konkana Sen Sharma), Vinay Patnaik's younger sister, is Ajay's only support as Ajay and Vinay fight it out against each other. The investigation transpires into a mystery locked with secrets. Behind the secrets lies an astonishing discovery. Ripples begin with wits and mind games. No one can solve the mystery until Ajay comes out with his own supremacy.